Another tweet, another market sell-off. - MW Capital Management Pte Ltd.
Monday, the markets where positive for a possible truce to the trade ‘war’. Tuesday, the market responded to Trump’s tweet that he is ‘a tariff man’. Perhaps there was never much to celebrate in the first place. It does though, buy both parties some time. Another factor to explain the sell-off is yield curve inversion, which is a harbinger for a slowdown in the next few years. The yield curve has though been close to inverting for some time and is already inverted for a number of markets. So, we don’t see that as a real trigger. There does though, appear to have been some rebalancing by risk parity funds which may have been exacerbated by algorithmic trading and trend followers. 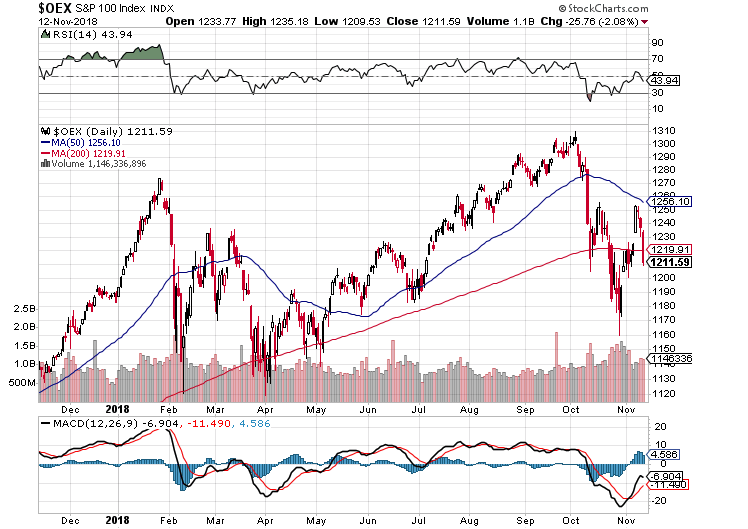 Of note is the 50 and 200 dma acted as a resistance…. 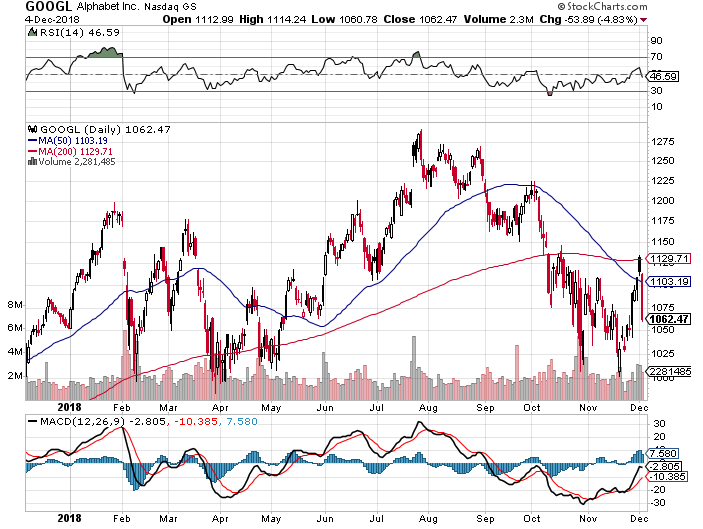 Google’s performance is also instrumental, as it is such a bell weather of the market and of the Technology sector. 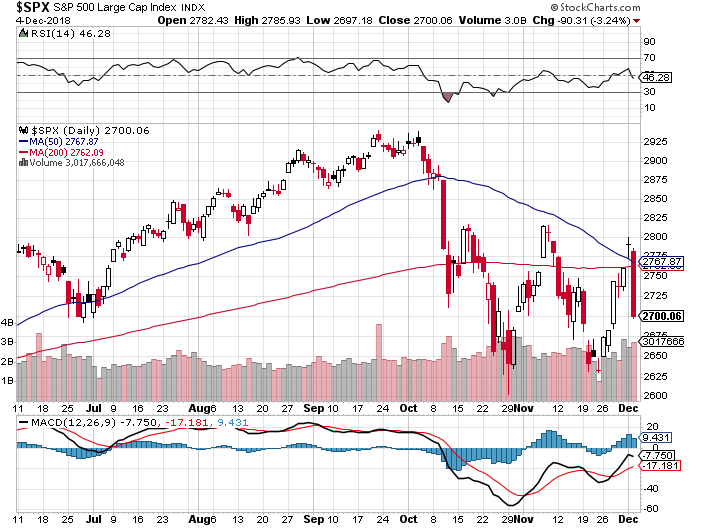 Again, the 200dma acted as resistance. We haven’t changed our view. It’s time to be cautious and sell into the rallies, expecting 2019 and 2020 to be difficult years. 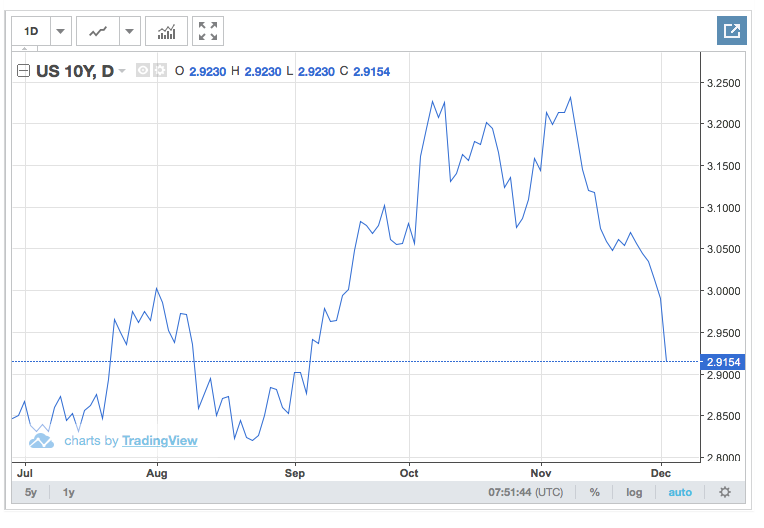 We have been advocating buying into mid duration (4-5yr) US Treasury debt and this has played out reasonably well. See our last Insights. A safe play, with a 2.75% yield. We are not yet going long duration (10yr or longer) as we see the markets and interest rates still being fairly volatile. We do though, anticipate that the Fed hasn’t that much further to go in terms of rate increases. At least that is what the curve is telling us. In addition to becoming more bullish on US treasury debt, we are also looking at managers that can provide short exposure to markets that we think are increasingly vulnerable, such as Australia. Fewer buyers, a declining property market, tighter lending standards and a shift from interest only to interest and capital repayment will likely, in our view, push that market into recession. That is of course assuming we don’t have a massive shift in current policy and a large liquidity injection from China. Central banks are still a force to be reckoned with, so care needs to be taken as to how to short any market. Keeping the bets small is perhaps the best. We are still holding onto some of our China technology names which have started to perform a little better and outperformed relatively on Tuesday. That’s a good sign. These are just a trade though. Another area that seems to have the potential for upside is Silver. 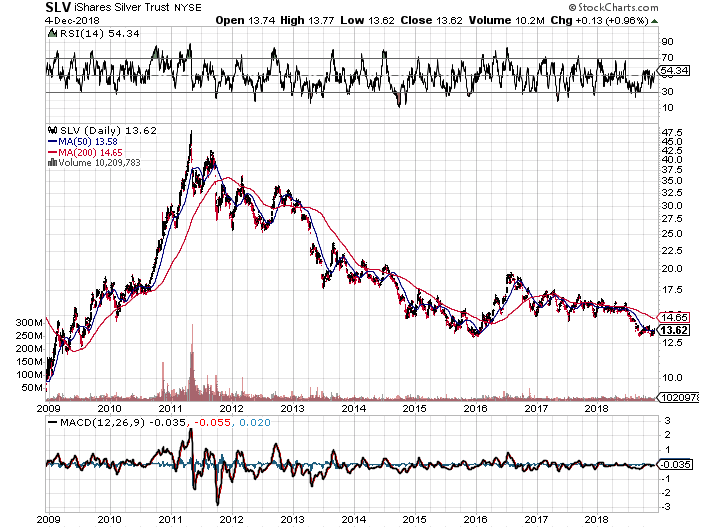 We already like Gold as a long-term hedge, but Silver is trading at levels seen in 2016 and as far back in 2009. With the gold silver ratio at record highs, having some exposure to this metal as a ‘beta’ play on gold seems to make sense. The chart above and that of the gold price and recent movement lower in yields all reinforce the idea that inflation is not seen by the market as a risk. We would concur. Indeed, debt overhang is an issue and the mal-investment over the last few years is likely to come back and haunt many market participants. We have been reducing our credit exposure accordingly. 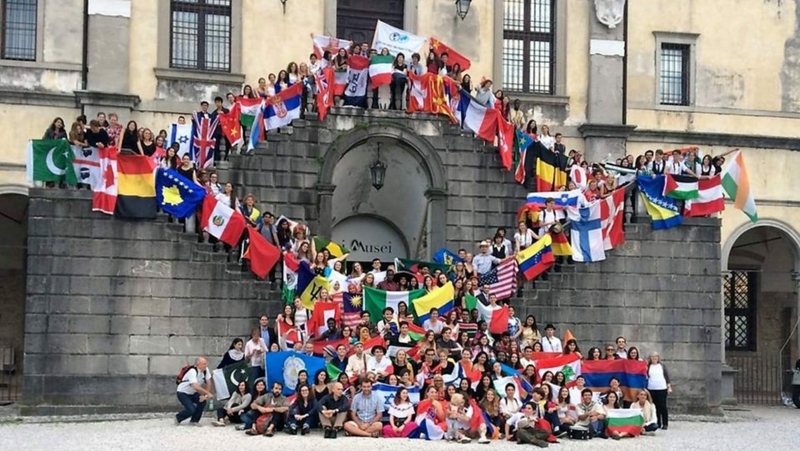 A little about the title image – this is typical example of the multi-cultural nature of United World College. My son attended a number of their campuses and graduated from there. 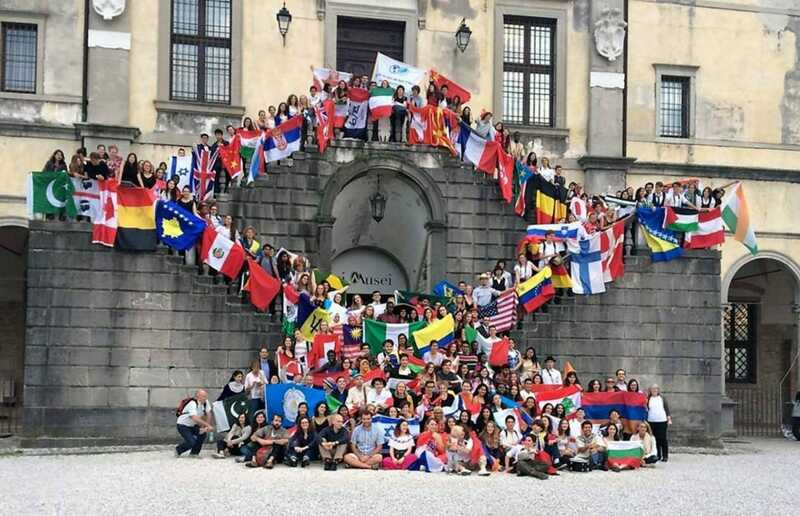 My wish is that there were more schools as multicultural as this. If they were ubiquitous, war could be a thing of the past. There would far greater global engagement and understanding. This material is mean for accredited clients only. Nothing in this document should be perceived in any way as a recommendation or solicitation to buy or sell any security or fund. The securities highlighted have been selected to illustrate MW Capital Management Pte Ltd investment approach and are not intended to indicate how any MW Capital Management Pte Ltd fund or account has performed or will perform in the future. The securities discussed herein in do not represent any entire portfolio or account managed or advised by MW Capital Management Pte Ltd and may not be suitable for all or any readers. Any views, forward looking statements, projections and current investments are based on assumptions and judgements. Because of the significant uncertainty inherent in any assumption and judgements we make, you should place no reliance on such forward-looking statements or views – they may not prove to be accurate and actual results may differ materially. Furthermore, they will change over time and should not be relied on in any way. There is no obligation for MW Capital Management Pte Ltd, and the company expressly disclaims any obligation, to update or alter the statements, predictions or any other information contained herein. This material is intended to be of general interest only and should not be construed as individual investment advice or a recommendation or solicitation to adopt any investment strategy. The views expressed may change without notice. Certain economic and market information contained herein has been obtained from published sources prepared by others. MW Capital Management Pte Ltd assumes no responsibility for the accuracy of such information. All investments involve risk, including the potential loss of principal.